It’s Halloween and you and your best friend are going for the ultimate “Dynamic Duo” costume. Maybe you’re considering Mario and Luigi or even the classic Thing 1 and Thing 2, but you’re afraid of being labeled a cliché. Well, we at the Clog have been feeling pretty spirited lately and have looked at UC Berkeley’s campus and quirks for our inspiration this Halloween. We’ve created our own list of dynamic duo costumes that you can use this Halloween to avoid your fear of being a cliché and show your Cal pride. We all know about Dirks’ alleged misuse of public funds after its exposure this past year, and now you and your best friend can continue to remind the students of UC Berkeley of the incident this Halloween. For Dirks, make sure your unibrow is on fleek, paired with tiny glasses, a fake mustache and a suit. If you’re the public funds component to this dynamic duo costume, you have the easy job. You just have to look like money. And be prepared to receive the question, “What are you supposed to be?” throughout the day. You may be familiar with everyone’s favorite golden bear, but what about his brother? Haaski is actually Oski’s older brother who attends the Haas School of Business. You can catch him hanging around the Haas business school in his suit and tie with his leather briefcase. Is he as creepy as Oski? Quite possibly. For Oski, all you need is his signature yellow cardigan, white gloves and an Oski mask. For Haaski, you need a mask, suit and briefcase. People might just think you’re just Oski in a business suit, but be prepared to correct them like the Haas-hole you are. Ah, Sproulers. For this costume, all you need is a stack of colorful flyers for your club’s free food night or mixer and a persistent attitude. Be careful when you’re hitting up Halloween parties though, because people may actually mistake you for an actual Sprouler who took their annoyance to the party. And, for the student dodging the Sprouler, all you need is a hoodie, over-ear headphones and a scowl on your face. So, something you probably already have. Poor Evans Hall. Now, you can go as campus’s ugliest building and its sidekick, a cracked mirror. It’s not Evans Hall’s fault that it’s so ugly, but the mirror can’t help it. If you’re going as Evans Hall, all you need is an old cardboard box with some windows measly drawn on it. And, if you’re going as the cracked mirror, buy a cheap over-the-door mirror from Target. Then, just add the cracks by standing in front of Evans Hall. Sorry, Evans. You’re just too ugly not to turn into a Halloween joke. But hey, it’s what’s on the inside that counts, right? Sorry again, Evans. If you have a class with an iClicker, you know what we’re talking about. iClicker translates to “attendance required.” To go as the iClicker, get out your own iClicker and a piece of cardboard, and copy your iClicker’s appearance onto the cardboard. Then, add string and drape the cardboard around you. If you’re going as the perfect attendance record, just find one of your old perfect attendance certificates from elementary school. If you ditched class even way back then, just make your own. 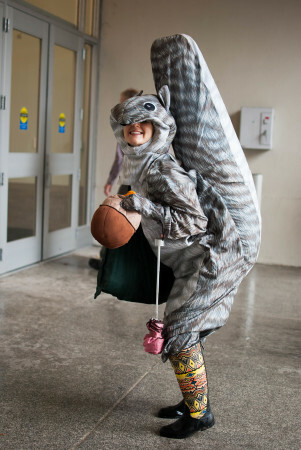 Berkeley squirrels and anything found in the compost bins — trash, food, your dreams — they all go hand in hand. After all, squirrels are always getting into our food. When they can’t get into our backpacks they enter the daunting path that is the Berkeley compost bins. For the squirrel, all you need is a brown shirt and pants, ears, a tail and drawn-on whiskers. For the compost bin, a cardboard box that says “compost” will do. While many despise the lack of meat in Unit 3’s dining hall, Café 3, now’s your chance for you and your best friend to either appreciate it to the fullest extent or mock it. We at the Clog suppose it depends on how vegan you are. If you’re dressing up as Café 3, gather five different cardboard boxes — four to fit over your arms and legs and one to fit over your torso. Your torso will be Café 3, and each arm and leg will be a building of Unit 3. If you’re the vegetable, pick any (gross) vegetable of choice. Or, if you really want to mock Unit 3 dwellers, dress up as a piece of meat and use Lady Gaga as some inspiration. Be the ghost of Café 3 past. Contact Chloe Lelchuk at [email protected].